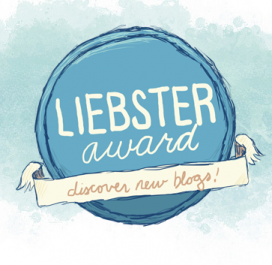 Tackling the issue of peer pressure: free resource! Navigating the mindfield of friendships, trying to fit in and still be true to yourself is a process that each and every teenager has to go through and for some it is easier than for others. 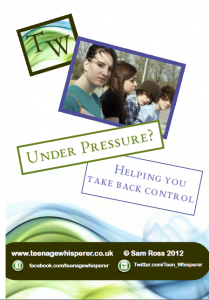 Peer pressure is something that everyone experiences but it is a particularly difficult issue for teenagers as they are in the middle of establishing ‘who’ they are in absolute terms and relative to other teens. This can shift on a daily basis depending on who they are with and how they feel in that moment. Helping them to understand and cope with this, to ‘listen’ to themselves and to fight negative thoughts about self with positive ones can assist them in making the best choices for themselves. 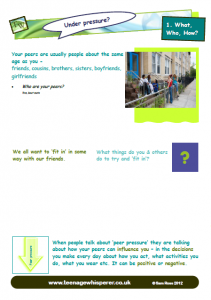 Available now to download for free is a high quality programme of peer pressure worksheets and activities designed to help teenagers explore these issues and to ensure that they are in control of their relationships. It can be used in one-to-one or group sessions, including in PSHE lessons and can be used to address all sorts of peer pressure issues, such as alcohol / drinking, drugs, smoking and offending. It can also be used preventatively, prior to peer pressure becoming a major issue, as it also explores peer pressure more generally and how to resist it. The first part of the programme looks at who peers are, what is peer pressure, positive and negative peer pressure, and the role of alcohol and drugs in decision-making before the PROVE YOURSELF method for making the right choices is presented. The power of positive thinking about self is also explored. The second part of the programme involves watching peer pressure examples in film clips and exploring how the main character could have made better decisions if she had used the PROVE YOURSELF technique. The programme does not have to be used in its entirety, although this is recommended, and workers can pick and choose the most applicable sections if they are particularly pushed for time. The free download includes a 14 page young person handout and an 18 page facilitator copy complete with notes, extension activities and more! To receive your free copy all you have to do is enter your email address below to receive a link to the files. By entering your email address you are agreeing to receive occasional emails from me, informing you of new posts and special offers, and you can unsubscribe at any time. I promise that your email address is safe with me- I NEVER share with third parties as that is just plain annoying!